The year round warm climate of Northland makes it a favourite holiday destination for many of us Kiwis. The Northland region is steeped in Maori legend and pioneering history. 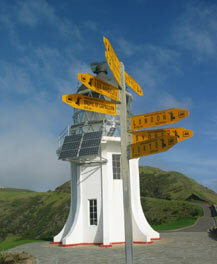 It encompasses the dramatic Cape Reinga, 90 mile beach, and the Bay of Islands. Main centres include Kaitaia, Paihia, Whangarei, Dargaville, Kerikeri, Waitangi and Russell. The northern tip of New Zealand is Cape Reinga. Witnessing the stunning geography at Cape Reinga is a must-see. A windswept cliff top adorned with lonely lighthouse and a gnarled pohutukawa, looks down onto the mighty force of the Tasman Sea and the Pacific Ocean as they collide forming ten metre waves and explosions of spray. The landscape holds great spiritual significance. The venerated pohutukawa is the Reinga, "the place of leaping" in Maori mythology, where the spirits of the dead leap off the headland and climb down the roots of the old tree, and descend into the underworld to return to their traditional homeland of Hawaiiki. Another attraction is the Kauri Coast, in particular Waipoua Kauri Forest. It is the largest remaining tract of native forest in Northland. Here you see the two largest living kauris (Tane Mahuta and Te Matua Ngahere). On the east coast is the aquatic playground, the Bay of Islands. Made up of 144 islands, you'll find plenty of great sheltered bays and superb fishing. Hole in the Rock is a popular sight to see and your boat trip out to see it can be combined with a swim with the dolphins. Most visitors to the Bay of islands stay in Paihia but Russell is fantastic to visit also, with so much history and amazing cafes and restaurants. The Waitangi Grounds is just a short drive from Paihia. Northland has many award-winning wines and all the vineyards welcome visitors and tastings. All around the region you will find truly standout cuisine being created with fresh local produce. Seafood fans will be absolutely delighted with the fresh and plentiful selection readily available. It is impossible to sum up all the attractions and things to do in the Northland region in just one page. The links below will help you guide your search through all the information on KiwiWise regarding New Zealand's beautiful northern region, Northland.